Jim Gaffney started his vaudeville career in the early 1900s, working for small touring concerns like Gavini’s Entertainers (1903), Swift’s Entertainers, George Marlow‘s Travesty Co, and Wilson and Hawthorn (1905), before securing contracts with established city-based managers like Harry Clay, Ted Holland, James Brennan, Dix-Baker, Lennon, Hyman and Lennon, and Marino Lucas. 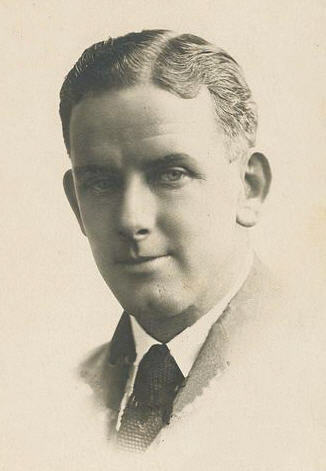 He established partnerships with John Farrell (1909-1910) and Les Shipp (1912-1919), and was a regular on both Harry Clay’s New South Wales and the Fullers‘ Australasian circuits until the late-1910s. Gaffney also managed several of his own companies, including the Star Elite Co (1912). His last known stage appearance was in Sydney in 1920 with Frank Reis at the Enmore Theatre (Newtown). Gaffney was born and raised in Pyrmont, Sydney. Image source: Truth (Brisbane ) 10 May (1908), 3. 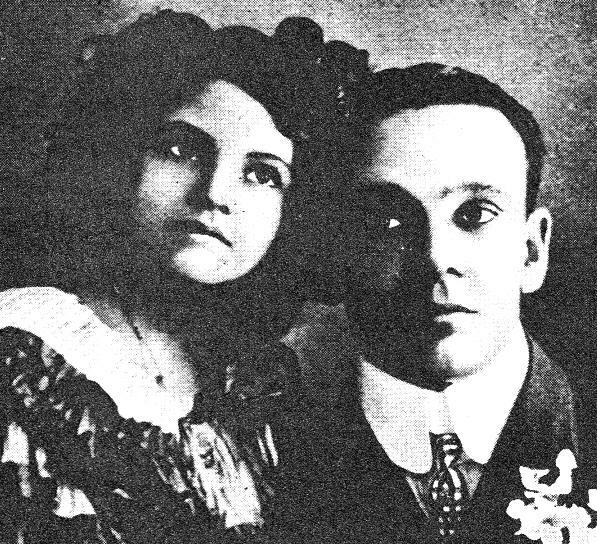 The daughter of variety artists Sam and Myra Gale, Sadie appearing on stage with her father as a child in the early 1900s (billed as Gale and Sadie). Following his death in 1912 she worked with her mother in a similar act. Gale was later associated with George Wallace and his revusical company, before teaming up with her future husband, Roy Rene. She continued performing on the stage up until at least 1950, both on her own and with her husband. She also co-starred in his radio series The Misadventures of Mo (1940). Sam Gale began his solo career in the mid 1890s and later developed an act with his young daughter Sadie. He was also heavily involved in setting up two variety artists associations in Melbourne and Sydney around 1906 and 1907. After he was killed in 1912 by a Sydney tram, his wife, Myra, and daughter formed a stage act together. (ca. 1849-1908) Comedian, clog dancer, singer. Dave Gardner was possibly the only blackface minstrel to appear as an indigenous character – presenting “outback” or “back blocks” comedy routines (billed as “Aboriginalities”) that were popular during the 1890s and early 1900s. His career in Australia dates back to the early 1870s, however, when he worked a traditional American plantation song and dance act. Over the next four decades he was associated with such managers/firms as Baker & Verner, R.B. Lewis, Charles Hugo, Tommy Hudson, F.M. Clark, Charles and Harry Cogill, Dan Tracey, Carroll’s Federal Minstrels, Peoples Concerts (Melbourne), and Harry Barrington. He also toured Buckley and Gardner’s Minstrels during the 1880s. 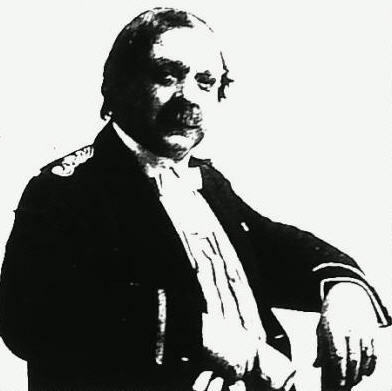 Gardner died in Melbourne aged 59. The brother of minstrels Johnny and George Gardner. Although their country of origin has not yet been firmly ascertained, several advertisements have been located which suggest the possibility they were Americans. 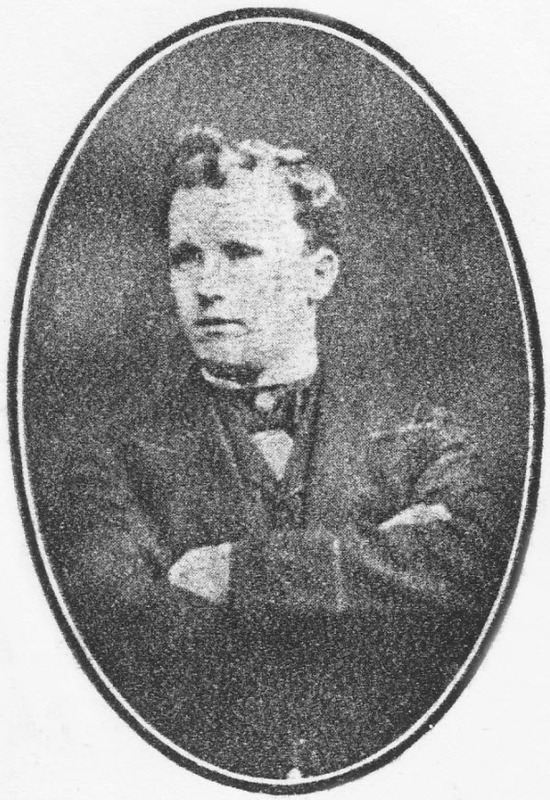 Johnny Gardner (with his brother and Dave) has first been linked to the Australian stage in 1875 as a member of La Feuillade and Buckley’s Minstrels. Over the next two decades the brothers alternated engagements together – including Baker’s Hibernicon, Buckley and Gardners’ Minstrels, People’s Concerts (Melbourne), and Gardners’ Union Minstrels – with work on their own. Although Johnny’s career was primarily associated with the People Concerts, he also appeared with troupes like Moore’s Troubadours. He and Jantz Kohlman then presented a regular musical/comedy and sketch act at the People’s Concerts between 1892 and 1908. His last known stage appearance was at the People’s Concert’s Jubilee celebrations in 1917. 1: Another brother, George, was also well-known in Australia as a minstrel entertainer. Although their country of origin has not yet been ascertained, several advertisements have been located which suggest that the brothers may have been Americans. 2: Kohlman and Gardner began specializing in musical sketches and farces from the mid-1890s onwards. 3: Not to be confused with the musician Johnny Gardner, son of Mr and Mrs George Gardner (aka The Musical Gardners). Rus Garling enlisted in the Australian Imperial Forces in 1916 and served on the Western Front until he developed pleurisy and pneumonia. He was also diagnosed with tuberculosis. Forced to return home to recuperate Garling entertained fellow hospital patients with card tricks and began developing a ventriloquist and magic act. Through his father’s involvement with G.W. Heans, he found permanent daytime employment but also established himself as a Sydney-based variety entertainer (notably with his ventriloqual doll Jerry). He became heavily involved in radio during the late-1920s and 1930s, too. Garling appeared in Australia’s first radio revue (1927), produced his own radio specials and worked regularly as an on-air entertainer. He continued to work in the theatre and in cinemas up until at least the mid-1950s. 1: His father, Percy Garling began his association with G.W. Heans Pty Ltd sometime prior to World War I, and eventually became the company’s Sydney, and then Australian, manager. In emails to the Australian Variety Theatre Archive (27, 29 Sept. and 3 Oct. 2017), Rus Garling’s daughter Beverley Foulds indicates that her grandfather purchased the company from Hean in 1921. 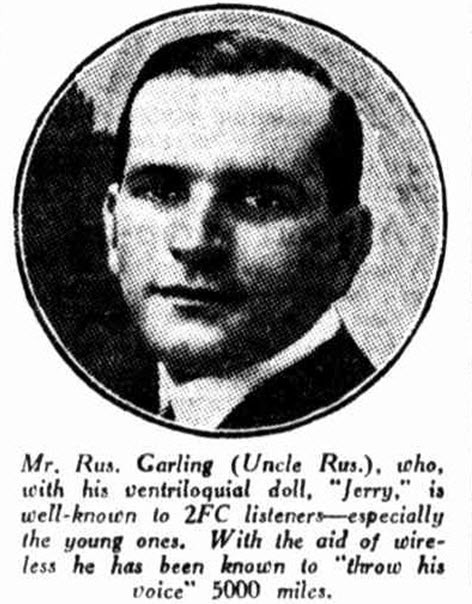 2: Well-known to radio listeners as “Uncle Rus,” Garling’s career in the broadcast medium as largely through Sydney stations 2FC and 2BL. 3. Garling had a long association with the Far West Children’s Health Scheme, founded in Manly (Sydney) in 1924 by Reverend Stanley Drummond. During the 1930s he toured the Far West Concert Party through regional centres on several occasions. He was also active as a concert organiser and entertainer during World War II. This included shows for US soldiers at the American Centre in Sydney. Family history information courtesy of Beverley Foulds. Image source: Sun (Sydney) 17 May (1927), 6. English comedian, monologist, tenor, actor, writer director, producer, troupe manager. Walter George and Georgie Martin founded the Light Opera Singers in London in the early 1890s. As the Smart Set Entertainers the troupe toured Australia between 1912 and 1915 before disbanding when George and Martin joined Edward Branscombe‘s Scarlet Dandies. They reformed the Smart Set in 1917 and four years later founded the Sunshine Players (1921-27). George later toured with Moon and Morris, Stanley McKay and another of his own companies, the Novelletes (1929) before moving into radio as producer for the Australian Broadcasting Commission (ABC). See also Georgie Martin • The Smart Set • Walter George Sunshine Players. (1891-1971) Circus clown, acrobat, comedian, pantomime dame, revusical writer/producer, songwriter, film actor/director/screenwriter. Considered one of the five great post-World War I vaudeville comedians, along with Nat Phillips and Roy Rene (Stiffy and Mo), George Wallace and Bert Le Blanc), Jim Gerald started out as child circus performer before establishing himself as a pantomime dame, comedian and sketch artist, first touring with Stanley McKay and later on the Fullers’ Theatres circuit. After returning from active duty in the war he and his wife Essie Jennings appeared with the Walter George Sunshine Players before establishing their own revusical troupe. Gerald toured the troupe throughout Australasia during the 1920s and early 1930s and then went on to star in revue and on radio up until the 1950s. From early 1918 Hilda Gifford began securing occasional engagements without her sister Violet, with whom she had worked exclusively since at least 1909 (as the Gifford Sisters). Initially billed as the “Ragtime Girl,” her solo turn comprised comedy, dancing and singing. During the 1920s she worked for such firms as Dix-Baker (Newcastle), Lashwood and De Car, Ike Beck (Hunter Valley), George Drew and the Fullers. 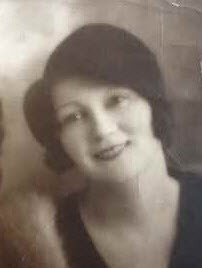 Her last engagement identified to date was in 1929 touring with Roy Rene (Mo’s Merrymakers). In 1932 the Mercolized Wax company included Gifford in a list of “famous society, stage and screens stars” to use the product. (ca. 1909-1918) Song and dance act. 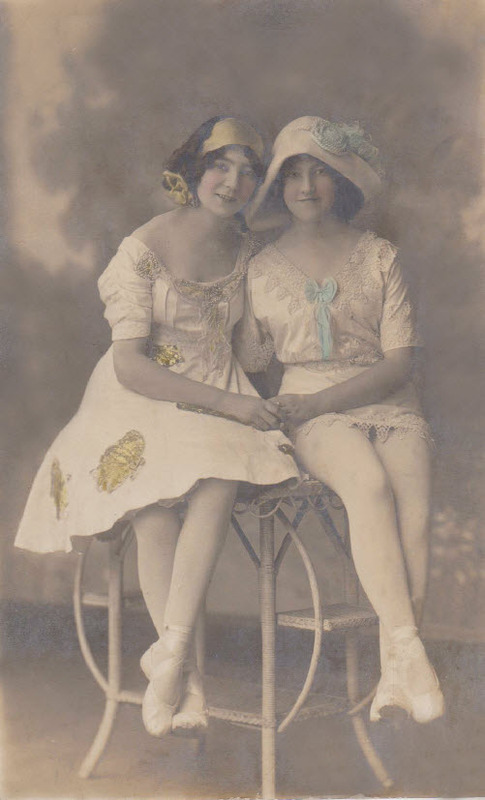 Violet and Hilda Gifford were active as a professional variety between 1909 and 1918. After starting out in Melbourne the established their reputations in regional Victoria, Tasmania, Sydney and some parts of New South Wales (including Sydney and Newcastle). Among the leading firms they worked for were J. and N. Tait, James Brennan, Harry Clay, Marino Lucas (Tasmania), J.C. Bain and Fullers’ Theatres. The Gifford Sisters mainly presented a song and dance turn and were often praised for their trick dancing. Their last known stage appearance together was during the vaudeville support program for a boxing event at the Sydney Hippodrome in August 1918. 1: Another sister Alma Gifford (1903-2000) worked as a contortionist. 2: Violet Gifford (1897-1989) married New Zealand-born Timothy Barr (aka Tim Vernon) in 1916. He was also well-known throughout Australasia as one half of the Eclair Brothers, an acrobatic, equilibrist and strength act. The couple briefly worked an act together, billed as Vernon and Gifford, after the end of the Gifford Sisters partnership. Violet retired after losing much of her hearing during an incident that occurred while standing off-stage. Image source: The family of Violet and Hilda Gifford (thanks to Tanya O’Neill). English-born variety comedian, actor, singer, and lyricist/ songwriter. Engaged as a musical comedy actor during his early career in Australia, Bert Gilbert first toured here with his wife Ada Reeve (1897-98) under contract with Williamson and Musgrove. He returned in 1907 for Williamson and was later associated with James Brennan‘s Vaudeville Players (1911-12) and Pat Hanna‘s Famous Diggers (1924-26). 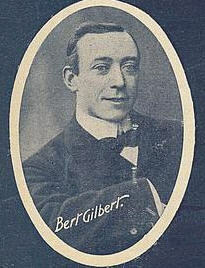 Gilbert was also well-known for his comic songs, many of which he wrote himself. He was also heard on radio performing as a comedian/singer and actor from 1927 up until at least the early-1930s. (1916-ca. 1930s) Sketch and song and dance act. Will Gilbert (“the human hairpin”) came to the attention of Australasian variety audiences through his long partnership with Ern Delavale. After they parted ways in 1916 Gilbert formed an act with his wife Dora. Billed as The Gilberts (and sometimes The Two Gilberts), the pair specialised in sketch work, including song and dance routines. The act was particularly popular on Harry Clay‘s various circuits during the late 1910s and 1920s. Their last known shows were performed with Hal Andrews during the Empire Variety Company’s tour of Western Australia in 1929. For more details relating to Will Gilbert see Delavale & Gilbert. Comedian, endman, burlesque balladist, writer/songwriter. Although considered one of Australia’s greatest minstrel comedians, very little is known of Johnny Gilmore’s life before 1883 and after 1919. Reportedly “a native of Geelong,” his career during the late-1890s saw him rank alongside such stars as Horace Bent, Charlie Fanning and Pope and Sayles. In huge demand he worked for all the leading firms including the Cogills, Charles Hugo, Harry Rickards, F.M. Clark, Frank Smith, and Joseph Billin before moving to Britain where he carved out a successful career between 1893 and 1909 (largely for Moss-Stoll). After returning home, under contract to Harry Rickards, Gilmore later worked for James Brennan, Ted Holland, J.C. Bain, the Tivoli circuit, and Fullers’ Theatres (until ca. 1919). 1: Gilmore is thought to have written much of his own material, as well as farces, sketches and burlesques for the various companies he was a member of. 2: His wife was Sydney skirt-dancer Kitty Synnott. Image source: Australian Variety 21 Dec. (1917), n. pag. Devised and produced by American C. Post Mason for the Tivoli circuit, one critic noted that it was “hardly likely to appeal to vaudeville patrons” but nevertheless “caught on” with Tivoli audiences (Sun 27 June 1913, 12). The also act garnered largely positive reviews suggesting that the spectacular visual component, combined with the Glory Girl’s “sweet soprano voice” and gorgeous costumes were at the forefront of its success. Mason and Hugh D. McIntosh also orchestrated a publicity campaign that promoted her as a mystery woman, and included competitions based around uncovering her identity. 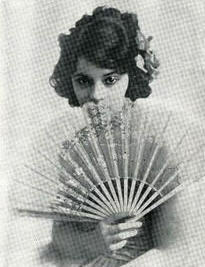 The public did not become aware that the Glory Girl was Emilie Dani until May 1914 when she began using the name to help promote her new career partnering comedian Joe Charles. 1: The Glory Girl’s Tivoli itinerary was: Sydney (21 June – 17 July), Melbourne (19 July – 21 Aug.) and Adelaide (23 Aug. – ca. mid-September). 2: C. Post Mason engaged the Glory Girl as the feature artist for a tour of Queensland with his Record Breakers’ company. After a week in Brisbane (11-17 Oct.) the company played towns in the south-east and south-west before heading north to along the Birch and Carroll circuit. The Glory Girl’s final appearances were with the Record Breakers at the Crystal Gardens, Fortitude Valley, Brisbane over December and early January. The name continued to be associated with Dani throughout the remainder of her career, however. 3: Among the songs she performed were “Ava Maria” (Bach-Giunod), “Ora Pro Nobis” (Piccolomini), and “Angels Ever Bright” (Handel). The visual settings included the outside and inside of a cathedral. 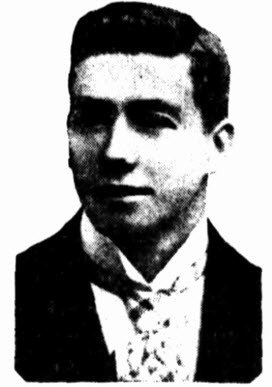 Image source: Sun (Sydney) 22 June (1913), 4. Edward A. Glover wrote comedy songs and sketches for himself and other performers and is known to have performed as a comedian with several minstrel companies in the late 1870s and 1880s (notably with F.M. Clark). His last known whereabouts was as George Barr’s manager at the Haymarket Music Hall (Sydney) in the late 1880s. Acrobatic comedian, singer, dancer, endman. Claude Golding career began around the turn of the century and by 1907 was working for such managers as Ted Holland and Harry Clay. He later worked an act with Bert Corrie before teaming up Clara Keating. The couple spent some 9 years in the USA beginning 1909. Golding died in New York in 1919, possibly from the Spanish Flu. Singer (tenor), venue and concert party proprietor, concert director. Considered one of Australia’s best cyclists around the turn of the century, Benjamin Goodson also possessed a fine tenor voice. He initially established himself as an illustrated singer in Victoria and South Australia before returning to his hometown of Rockhampton in 1909. Shortly afterwards he and his brother Harold opened Goodsons’ Pictures (an open-air film and vaudeville show). Although commercial business concerns occupied much of his attention during the 1910s Goodson maintained a connection with theatrical enterprises. He often appeared at and helped manage local musical events, performed semi-professionally around the region, and occasionally put together his own concert party (often in association with the Flying Squadron Orchestra). Goodson’s greatest cycling success was winning the 1899 World Amateur Championship in Montreal, Canada. In 1921 he left the running of his family’s furniture business to his brother and became publican at Rockhampton’s Exchange Hotel. Goodson, his wife and children later moved to Sydney. Image source: Morning Bulletin 28 Mar. (1936), 12. (ca. 1837-1869) English-born singer, actress, entertainer, musician (piano). The daughter of actor William Gordon (reportedly of noble descent), Harriet Gordon made a name for herself in London as a singer/pianist from the age of nine. She turned to acting in her late teens and in 1859 began establishing an equally promising career in the USA. Two years later, however, she accompanied Australian-based comedian/actor J. P. Hydes back to the colonies. After making her debut for George Fawcett at Melbourne’s Princess Theatre in the comic opera The Two Figaros (16 Mar. 1861) the couple appeared in numerous Australian dramatic, comedy, burlesque, pantomime and variety productions (including the 1865 Lancashire Bellringers tour) before moving to New Zealand in 1867. Gordon died in Auckland on 13 March 1869, aged only 32. 2: Hydes and Gordon were often referred to as husband and wife. However no record of their marriage has yet been located. Interestingly an article titled “Recent Marriages of Actresses” appears in several Australian newspapers in the latter months of 1858. While no specific locations for the marriages are given the article appears to focus on recent marriages in England. Among the reports is the wedding of “popular actress and vocalist Miss Harriet Gordon” to Lieutenant J.D. Weiss of Her Majesty’s Service. 3: Hydes and Gordon’s only child, Walter, also pursued a career in music and the theatre. (ca. 1843-1900) Irish-born actress, singer, dancer, musician (cello), entrepreneur. 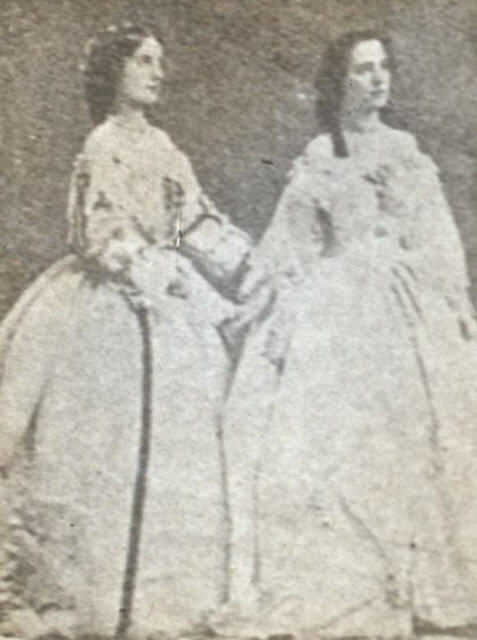 Josephine and Adelaide Gougenheim made their theatrical debuts as juveniles in London in 1850, and later cemented international reputations in America (1855, 1859-60) and Australia (1856-59). After touring for George Coppin, they leased Melbourne’s Princess’s Theatre for the purposes of drama, burlesque and pantomime. In 1861 Adelaide retired into marriage in England and Joey returned to Australia. She found success with a solo show at the Gulgong goldfields (New South Wales) in 1871 and later with her own dramatic company (1871-72). After retiring from the stage Gougenheim ran a Sydney boarding house. Image: Gougenheim Sisters. Source: NYPL Digital Gallery. (1913-ca.1919) Formed as a specialty turn inserted into the American Burlesque Company’s Sydney production of The Grafters, the Grafters Quartette was largely associated with Paul Stanhope‘s revusical troupe, both in Australia and the USA through until 1919, albeit with a changing line-up. The longest serving performers were original members Teddy Long and George McCall.